Alison Dean Cowitz is artsy. And she has the confidence and verve to try different things. No wishy-washy dialogue such as, “Do you think I should?”, “Where will I put it in my house?”, or “The colours just don’t match my throw pillows.” from her lips. Oh no, her ruminations run along the lines of “That’d be cool.”, “I’m going to try that.”, and “I wonder what would happen if . . .”. 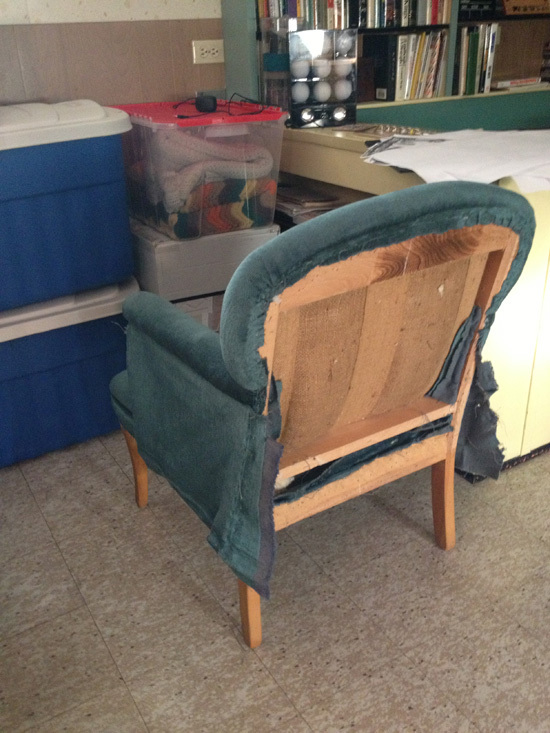 Her attitude combined with some inspiration from Pinterest lead her to finding a chair to recover with One-Block Wonder* pieced segments. 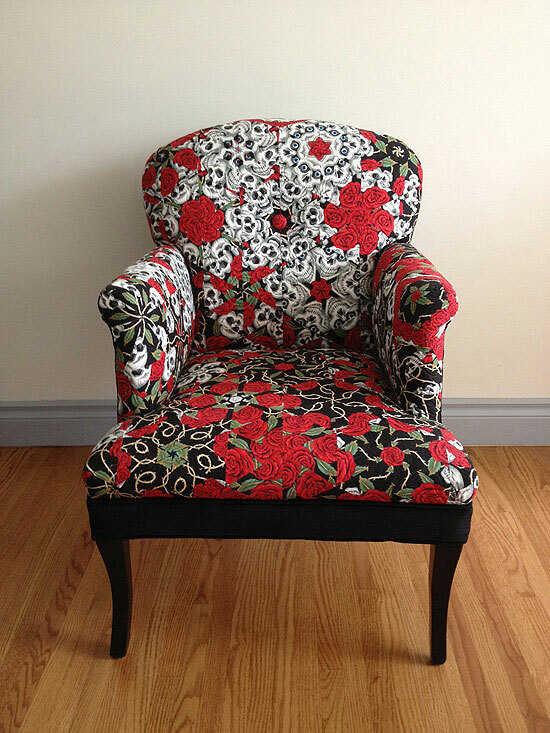 Here’s the chair she started out with. 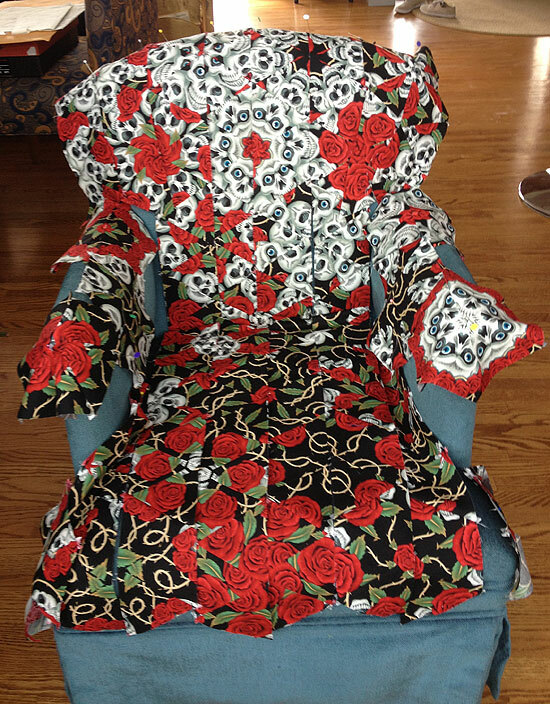 Using “The Rose Tatoo” print by Alexander Henry Fabrics, she constructed some one-block wonder pieces. 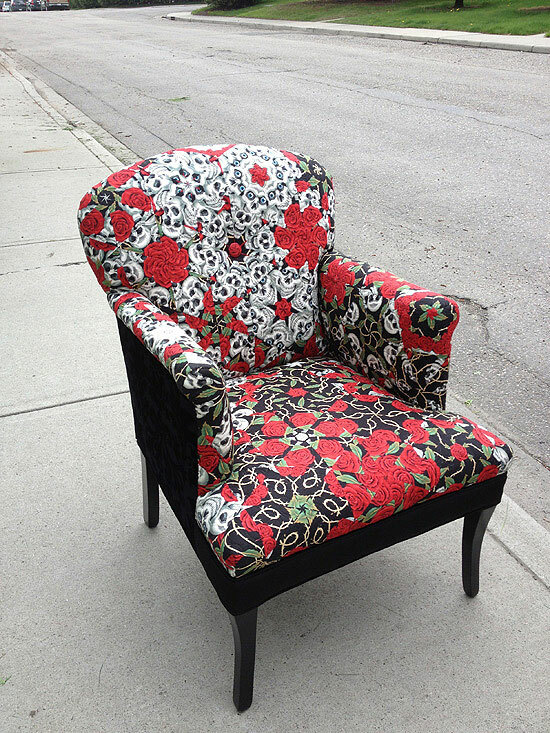 The chair became her design wall, and she laid the pieces out on it, blending the colours and pattern as she worked. 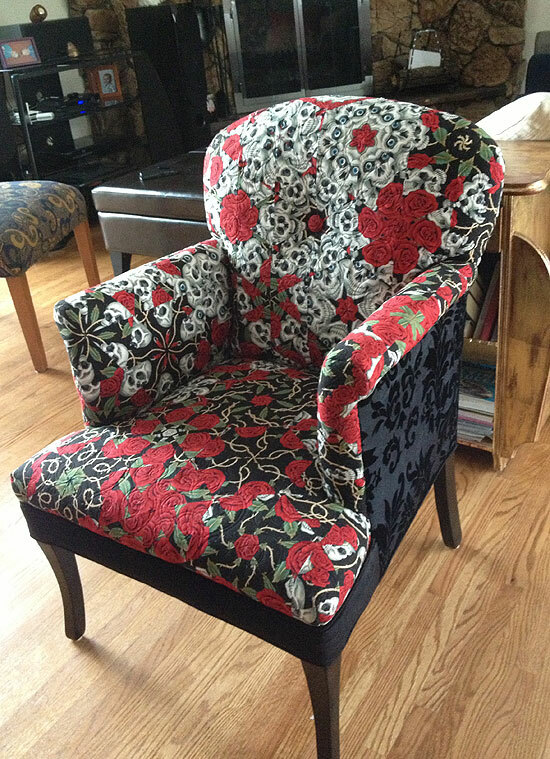 This chair was stripped of its old fabric, and Alison used it as the patterns for the shapes she needed to construct. She overlaid the new pieces on top of the old, and pieced them together as individual segments. She then sent the pieces along with batting and a backing to long-arm quilter, Corinne Johnson, to be quilted. Corinne used a strong invisible nylon thread to quilt it, as Alison wanted the fabric to “speak loudly”, instead of focusing on the quilting. 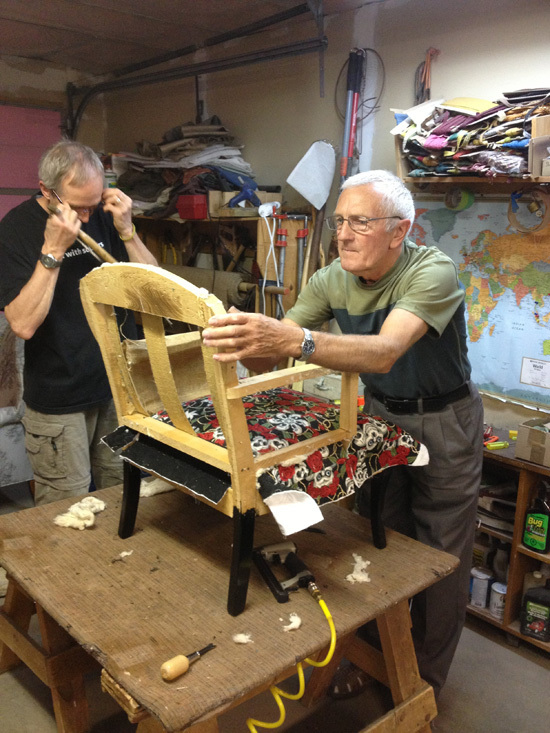 Alison was fortunate to be friends with a master of the art of upholstery, Bert Kroes, who knows the mechanics of taking apart, fixing, and putting everything back together again. 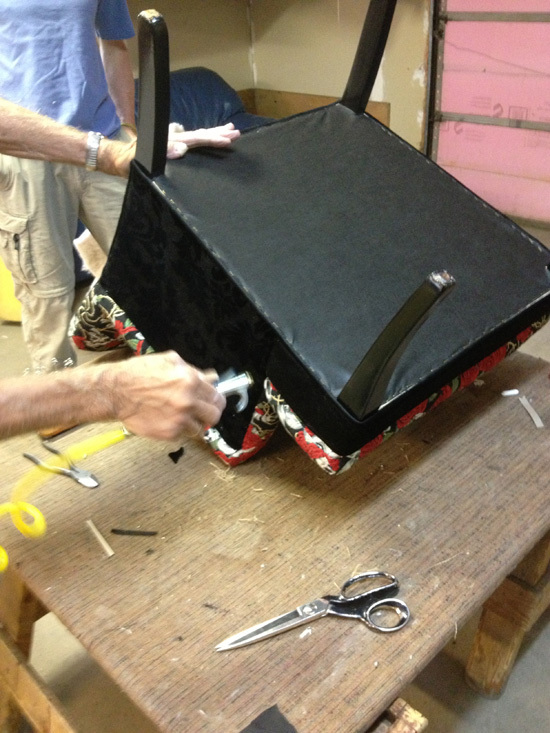 Here are some pictures of the process where Alison’s husband, Brent, and Bert worked together in the garage. 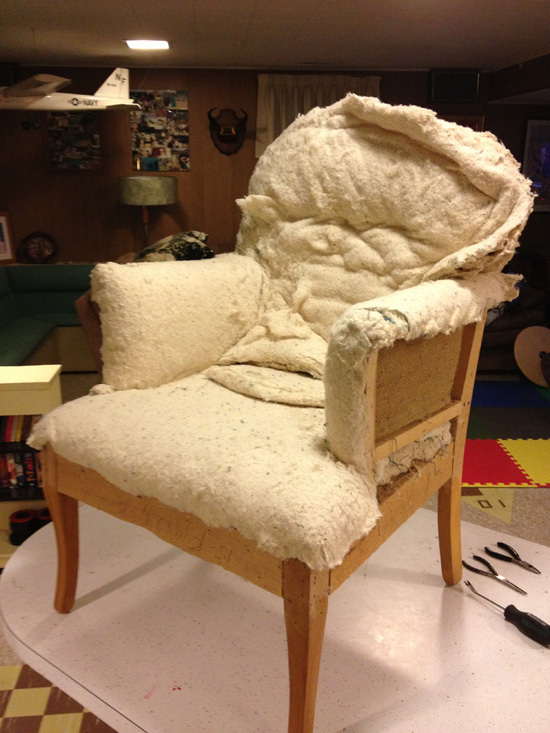 Bert removed the old padding, except for the seat, and added a bit more stuffing to boost it up. 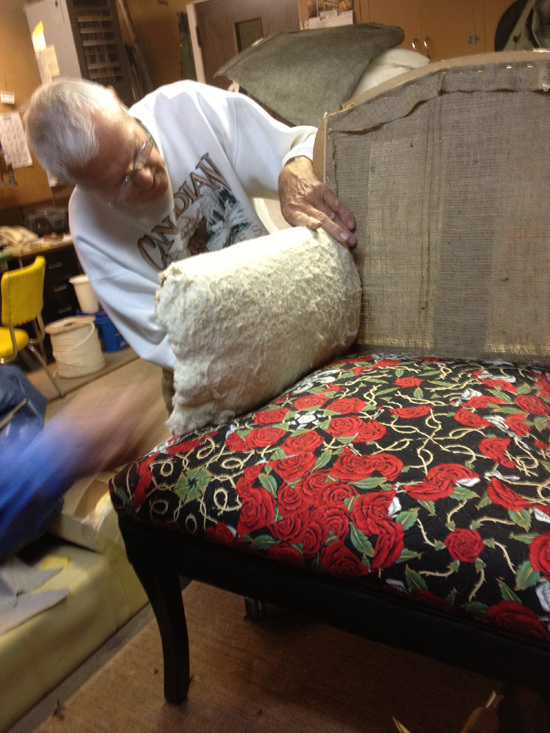 He cut and stapled the fabrics with a pneumatic staple gun in just the right places, wrapping the pieces tightly around the chair frame. Needle and thread were used to invisibly stitch the arms closed. 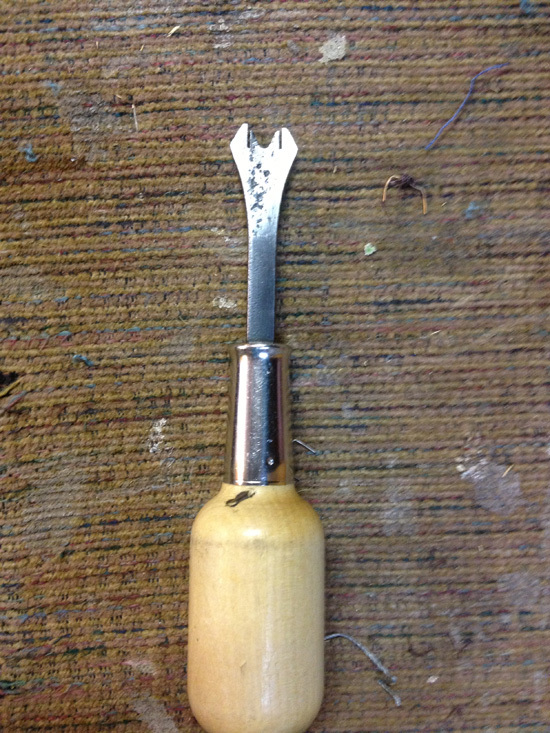 A button was put in the center block of the chair. Alison helped with some cutting and piping for the back and bottom. Want to eyeball it closer? Alison and her friend, Donna Sheppard are holding a show of their work called “Quilted Interpretations” at the Fernie Arts Station. The opening reception is on Halloween, October 31st from 7-9 pm (so appropos), and the show runs to November 25. Let me know if you would like Alison’s contact information. She would be able to give you the contact information for Corinne and Bert. 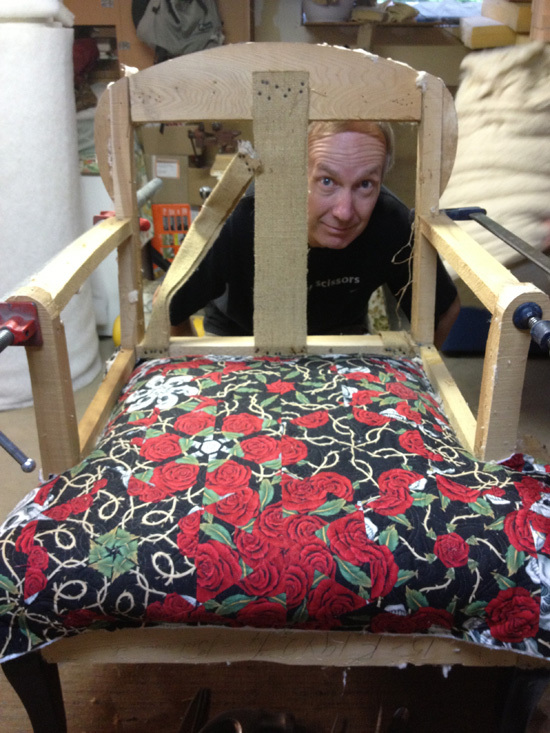 And if you love this fabric, we have more on its way. It can be ordered on our website here. *The one-block wonder technique is covered off in Maxine Rosenthal and Joy Pelzmann’s books, One-Block Wonders, One-Block Wonders Encore, and One-Block Wonders Cubed, all of which we regularly stock in-store and on-line.